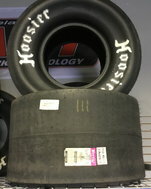 Drag Racing tires for sale for your funny car, pro stock, pro street, top fuel, top alcohol, junior dragster, door car and more. Brand New M/T rear 10.5 X 33W"X15". The stickers are on the slicks.